The Lord was born on Earth — on our planet. Once upon a time, our Savior, the Lord God Jesus Christ, walked on this very surface. He was born as an infant, a tiny, helpless baby: dependent on the willingness of a young woman and a young man to take care of Him. I cannot begin to wrap my mind around that! Every year, it hits me that this really happened. Our savior was a real human. At one point, He was so small that He could not speak words. At one point, our Savior was learning how to walk! When I was a child, I asked my father if Jesus, as an infant, could have looked at a tree and already known what it was. Even as a child, I was thinking about how it could be that the God of the universe was once an infant! And He was born for us. My heart feels the awe of it. Christmas is often overwhelming for many: the stress of getting everything done combined with far too much sugar and not enough sleep. However, my experience has shifted drastically. I still cry from too much sugar, not enough sleep, and the pressure of getting it all done, but the most overwhelming feeling in December is awe. I think about the reality of the Christmas story and what it took for everyone to play his or her part. Jesus Himself is obviously the most important focus of the story. How often do we think of the Lord’s innocence: the trust it took for Him to come as an infant, dependent on the innocence of others to do their part? He was dependent on the willingness of others to trust in the Divine and eternal plan. This is true innocence: a willingness to be led by the Lord. It is not naivete or guiltlessness. It is trust! Mary’s willingness is another strong focus: “Behold the maidservant of the Lord, let it be to me according to thy word.” I am amazed by the innocence and trust it required to accept this magnificent job with humility. Motherhood is one of the highest uses there is — especially to mother Jesus Christ. There is of course the innocence of the shepherds and the magi in hearing and seeking Christ, but an often overlooked figure is Joseph. I am always in awe of Mary, but, in the past few years, I have been quite touched by Joseph. There is something about the path he was already walking: he was already trying hard to do the right thing. Being a good man, he was not going to do anything to disgrace Mary publicly. He wanted to protect her, so he was trying to do the best with the information he had. This made him perfectly willing to hear the Lord’s explanation when he received it. Joseph’s willingness is incredible to me — and a perfect example of innocence. That willingness to be led by the Lord, being open and willing to hear His path for us is what we should all be striving toward. He loves us, and He is there telling us the way to go if we are willing to listen. Joseph was willing. Time and time again, I am struck by the way he listens and immediately does what the Lord tells him to do. Reading it now makes me cry. Who does that? Who drops everything and follows the Lord? Everything about the Christmas story makes me cry, but I have been so touched by the masculine wisdom, the moral courage simply to do the Lord’s will. I cannot help but feel a similar state of trust at Christmas time. It is the most incredible experience. I feel humbled every December. Jesus was born on earth. Last December, I cried when my 9 year old niece sang How Far Is It To Bethlehem. This line in particular overwhelmed me: “Will He know we’ve come so far just for His sake?” I am struck by the innocence of little children singing about coming to the Lord. There is a reason innocence is linked with children. We are supposed to become like little children. As an adult, it can be hard to feel that receptive state. Doing things “just for His sake” is a remarkable innocence that can be hard to achieve. However, the reason it is achievable, the reason that we can become like little children is because God Himself did. Because He came as a child, we too can become like little children. The Lord offers Himself to us year round, but I feel a special reception of that innocence at Christmas time. I think that that is one of the best gifts we can receive for Christmas: the willingness to be led by the Lord. Thank you, Alison. I also keep being struck by the wonder that it ‘pleased the Lord’ to be born on this earth, and that He trusted people to care for Him as a tiny baby (people working against almost impossible odds of reasonable doubts and fears..yet they trusted the Lord’s Angel messenger implicitly). Mary, how strong and how trusting a vessel. Joseph, how strong and humble a protector. Mary and Joseph and Elizabeth and Zacharias, those wondering and hurrying shepherds, and the Wisemen… perhaps the first people in that new Church. I was struck by a card I received from a dear friend this year. It had a picture of Joseph, with his strong hands and kind face, teaching the Lord to walk. A dear friend pointed out, wouldn’t Joseph have also taught the Lord about the Word, and how to take his first spiritual steps? The painting is called ‘Walking with God’. I love that both paintings show the wonder of the Lord’s birth, yet also show that He was a Little Child, loved, held, guided by Mary and Joseph in their family. Wonderful article… but is it posted twice right in a row? I love her focus on the innocence and willingness to be led! Yes, it does look like the text repeats itself. And thank you! It was a pleasure to write it! 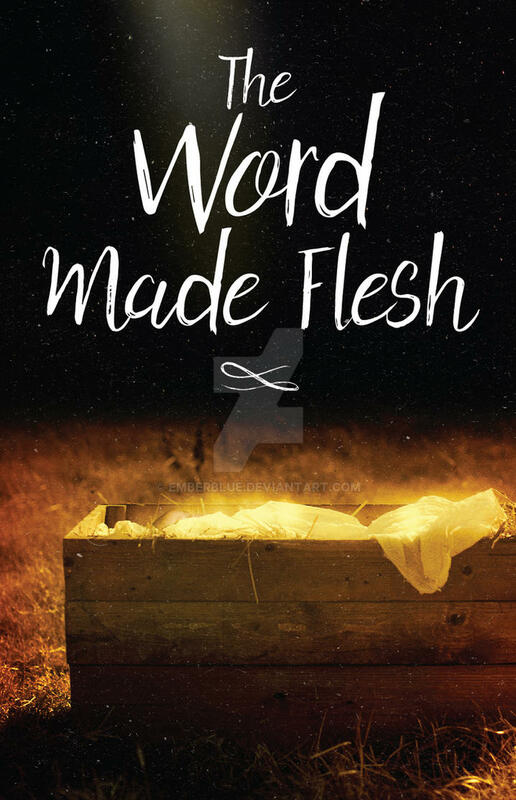 If you can open the jpg image above, you will see an image of “The Word Made Flesh” that I used for my Christmas card this year. I, too, am increasingly in awe of the miracle of God coming to Earth as a little child. Your article beautifully expressed the vulnerability and trust of that act. What love He had … and has … for us! I, too, am increasingly awed by the submission that Mary and Joseph showed when called the the humbling task of parenting the Lord of the Universe, their Savior (and ours). Now that I am a single mom, I am so much more aware of the difficulties that they must have known they would face: the false assumptions, the vulnerabilities, the hardships. (People would talk; they would be ostracized. “Yeah, we can do math,” people might say. Who would ever believe the truth about Mary’s baby’s conception?) And yet, they obeyed without a second thought. And though life was not easy, they were blessed. “I think that that is one of the best gifts we can receive for Christmas: the willingness to be led by the Lord.” AMEN!! Amen! Please keep writing, Alison. Your reflections and wide open, faithful heart are so profoundly useful.